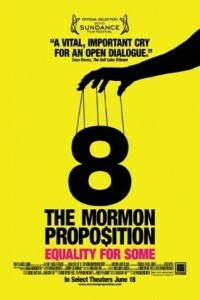 Written and directed by journalist and former Mormon missionary Reed Cowan, and narrated by Academy Award winning screenwriter Dustin Lance Black (Milk), the documentary movie “8: The Mormon Propostion” exposes the Mormon Church’s historic involvement in the promotion and passage of California’s Proposition 8 and the religion’s ongoing campaign against gay rights. The film takes place in California and Utah as Mormons, following their prophet’s call to action, wage spiritual warfare with money and misinformation against gay citizens, doing everything they can to deny them of marriage and the rights that come with it.Leave it to the Mormons. They can have 8 wives but… Such hypocrisy. As with ANY and ALL religions in this world, all of which are responsible for not only denying humans not adhering to ‘their’ beliefs common sense civil rights but, most, for all of the wars that have ever occurred in the history of this world.Not only will the movie open in theaters June 18th, 2010 (New York, Los Angeles, San Francisco, Chicago, Boston, Salt Lake City, Atlanta, Palm Springs, Phoenix, San Diego, Dallas, Houston and Honolulu), “8: THE MORMON PROPOSITION” will also debut day-and-date On Demand via cable and satellite providers and digital download channels.